We have nothing but amazing things to say about Daniel! He made the process leading up to the wedding so easy and provided clear details about what we were getting with our wedding package that we chose. A few days before our wedding, he flew in to meet with us personally, where we discussed our overall vision for our video. He listened to exactly what we wanted and exceeded out expectations with an incredible video. The day of the wedding he arrived promptly and was very professional. 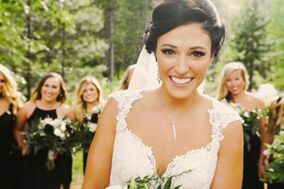 It is true what other brides say, the day of your wedding goes by so fast that all you are left with are photos and videos to remember how truly spectacular that day was. We are very happy that we can relive our moments through a video captured by Daniel of Branded Films! Daniel was very easy to work with and made an outstanding final product for us! Videography was something that was very important to my husband and I, from the shots to the music that was used in the final product. We learned about Branded Films from a friend who used them at their wedding. We met with Daniel prior to our wedding to go over our wants as well as learn about his style. He was very genuine and listened to what we wanted, taking our request and marrying that well with his own personal spin on the video. On the day of our wedding he was timely and professional as he roamed the venue capturing the most important moments of the day. As most weddings, we were running late and had to adjust where our first look and party photos would be taken, Daniel was very flexible given this change and we appreciate that so much during the small bit of chaos we felt on timing. We received our raw footage and first draft quickly after the wedding (within his time frame specified) and are excited to share the finished product with our family and friends. Thank you for everything Daniel! We highly recommend Branded Films to couples who are looking for a genuine, flexible and creative videographer! Daniel from branded films was wonderful! Day of he was easy to work with,on time and professional.The final cut of our video is incredible. It captured all the day's events in such a unique and different way. If I had to do it all over I wouldn't want anyone else to have captured our special day! Daniel is AMAZING!!! I found Daniel because he made the video for a friend's wedding and when I saw how amazing it was we knew we had to work with him! Not only did he take time at our wedding (he was there over 12 hours) but he also took extreme care with our wedding video! He made numerous edits for us and was so kind in the process. The first time I saw the wedding video it brought tears to my eyes! Every important moment was there and it brought a flood of emotions over me. My husband and I both had a laugh saying that Daniel made us look way cooler than we are in real life! :D Also, many guests commented on him afterwards that what he was doing looked so cool and they weren't actually sure what he was doing! Maybe it is my ignorance with technology but I didn't realize that the device he used looked pretty much like a camera to me but was actually a videocamera! Super cool and I can't wait until I have another event where I can hire him! We loved our wedding video. It was something we decided to do rather last minute, and I'm so glad we did. The video is not boring like most wedding videos. Everyone we showed it to loved it. Branded Films and Daniel Benitez were such a great addition to our wedding day. Daniel was so easy to work with, on time and never in the way. He is so great at what he does. It was wonderful to have him capture special and unique moments he saw with his eye behind the lens. Having the sample/viewing video during the reception was a treat and family/friends absolutely loved this and were very impressed. Daniel is amazing at what he does and the final product shows his true skill and passion. We are very thankful to have our wedding video to look back on and capture our special day. We recommend him without any hesitations! Our wedding video turned out amazing. It's different from other wedding videos that just record the events. It's an artistic video that highlights all my favorite moments of my wedding. Daniel with branded films is easy to work with and produces a great product. I have already recommended him to friends. Branded Films provided great service and product! It was great working with Daniel. He was very professional but yet made it felt like you were working with a friend and made everything comfortable throughout the entire process. We will continue to and have recommended Branded Films to our friends and family. We were very happy with everything! Daniel is a professional. He's great at what he does! He compiled a great video of our wedding that perfectly captured the happy mood and energy of the day. I would highly recommend Branded Films to any couple seeking an original heartfelt keepsake for their wedding! My husband and I cannot speak highly enough of Daniel and the work he does. His videos are very fun and definitely helped to make a big day more memorable with his video! He offers a great value in his services and was probably the easiest vendor to coordinate with of our entire wedding. They had a 'quick clip version' ready on site before the wedding was over that people were able to watch on site and they all stood around in awe of the video and that there was already something to watch! Stop reading and book this guy! Seriously, one of the best decisions we made. We decided for the videographer on the very last minute, and we couldn’t be happier. Daniel did a great job filming every aspect of our wedding. He was very professional and captured our precious and important moments throughout the ceremony and reception. He condensed the whole day into a one amazing story which we will cherish forever. Daniel did such a great job for us! Our budget was tight and he made miracles with it. We love the video he made for us! He worked so great with our photographer to make magic. If we did it again we wouldn't choose anyone else. My wife and I had a great experience dealing with Branded Films (Daniel). Being very picky individuals, my wife and I tend to micro manage and we found ourselves doing just that during the planning phase of our wedding. Even with our demanding requests, Daniel was able to accommodate whatever we needed. Even after the wedding, we were able to have clear communication with Daniel on specific events to be included in the highlight reel. We loved having the main feature film as well since it let us relive a lot of the wedding that had flown by from all the craziness that happened that day. Daniel was very thoughtful in taking our requests and putting them into the final product. He was quick to respond to emails, and didn't mind going the extra mile to make my wife and I happy. Would definitely recommend him to our friends and family! Daniel from Branded Films was a lifesaver! Our Videographer canceled the week before the wedding. With 5 days to spare, I was introduced to Daniel from a coworker. He not only worked with the budget we had, but also our timeline. He was very professional and personable. For a bride who was scrambling last minute, he not only put my mind at ease but my heart. We have been told over and over again how wonderful our Wedding highlight video is, and it sold itself. Many of our friends and families, and extensions of have used his services and they are all so Impressed. I would highly highly recommend Branded Films to anyone who is looking to not only capture the moment of your celebration but exactly who you are. We could not have been happier! Thanks again Branded Films! Awesome ...we watch the video always and Daniel captured all the important and meaningful moments. Daniel is the best in the business, and his body of work speaks for itself. From beginning to end, he was a pleasure to work with and delivered such a high quality product. On the day of, Daniel provided coverage for about 12 hours, being incredibly generous with his time as he meticulously documented every part of the experienced. He worked seamlessly with the photographers to make sure everyone was happy. And in the months that followed, Daniel was detail-oriented and attentive in providing three different edits of the video, making sure that, above all else, we were satisfied. At every point he was great - but really, I suggest looking at his videos. The shots and editing he provides are unlike almost anyone else. We could not recommend him enough! Daniel did a wonderful job and produced a really beautiful video. He captured amazing film without being intrusive. We were very very happy with the final product. Definitely recommend.